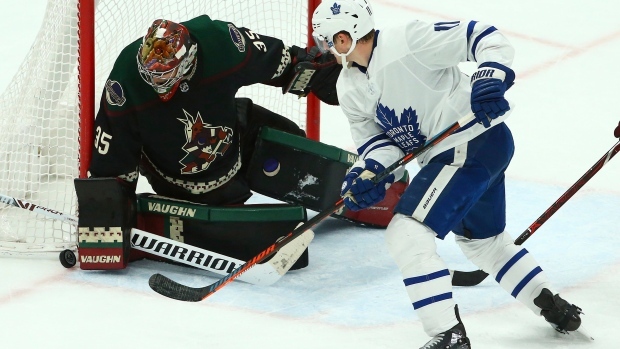 The high-flying Maple Leafs' offence never got off the ground Saturday night, as Toronto fell flat against the Arizona Coyotes in a 2-0 loss. That completed the season sweep of the Leafs by Arizona and halted Toronto's two-game win streak while becoming the Leafs second loss in four games to a team out of a playoff position. Toronto moves to 36-19-3 on the season. Toronto started Saturday’s game in complete control, not only of the puck but of the seemingly pro-Leafs crowd assembled in Scottsdale, Arizona. Rarely in the first half of the opening frame did Arizona even get past the red line, but key shot blocks and holding Toronto to the outside in the attacking zone confined the Leafs to only two shots on goal by midway through the period. Before long, that promising first period for Toronto had deteriorated, giving way to a commanding performance from the Coyotes in establishing a good cycle and tenacious forecheck to minimize Toronto’s skill players. Suddenly, the Leafs looked sloppy and off-balance, repeatedly failing to clear the zone and chasing the puck around ineffectively. After 20 minutes, Arizona was outshooting Toronto 11-4 in a goalless game. Into the second, Toronto still couldn’t make the Coyotes pay for their frequent turnovers (they had 18 giveaways on the night, to Toronto’s 11), and could barely get pucks on Darcy Kuemper at all. Arizona figured out how to capitalize on the Leafs errors though, taking advantage of a tired Morgan Rielly and Ron Hainsey to set up Alex Galchenyuk’s opening goal. Toronto’s shaky defence failed to abate from there and Josh Archibald extended Arizona’s lead to 2-0 with a rebound goal near the halfway mark of the second period. Toronto managed only five shots on goal in the first 31 minutes of the game, four at even strength and only one through the first 11 minutes of the second period. The Coyotes were blocking shots with abandon (26 total, to Toronto’s 17) and never allowed the Leafs to establish any rhythm in the offensive zone. Not even a four-minute power play for Toronto (assessed after Connor Brown was high-sticked in the face by Oliver Ekman-Larsson) could get them on track, as good sticks and proper positioning by the Coyotes halted Toronto against and again. The Leafs finished 0-for-4 on the power play, stopping their two-game streak of multiple goals with the extra man. Mike Babcock started the third period with Mitch Marner and Auston Matthews on a line together, as sure a sign as any the Leafs’ coach wasn’t happy with his team’s performance. Toronto didn’t markedly improve in the final frame despite the changes up front, either, and Arizona remained the faster, more relentless group while keeping the Leafs firmly at bay. With the Coyotes sitting 25th overall in the NHL, Saturday's defeat was another example of how Toronto winds up listless against some of the league's bottom teams. Their last five losses have all come against teams not in playoff position at the time of the matchup. It’s but once a year that Matthews gets a chance to play near his hometown of Scottsdale, and the NHL’s most famous Arizona native came into an already-exciting Saturday night game on an offensive roll to boot with three goals and three assists in his last two games. The Coyotes were ready for Matthews, though, and determined not to let him run wild. Through the first two periods, Matthews sat at just 35 per cent possession and wasn’t getting many good looks on net. He did manage a couple of chances on the Leafs’ later power play attempts, but Kuemper was prepared to take away the top of his net from Toronto’s sniper. With so many active Coyote sticks and so little open ice to move through, Arizona was able to neutralize Matthews, keeping him off the scoresheet for the first time in his three visits to Arizona (he had a goal and an assist in his first two games there). In 20:41 of ice time on Saturday, Matthews was credited with four shots on net and finished minus-one. His third visit home was also the first time Matthews has been involved in a road loss to the Coyotes; the Leafs were 2-0 in Arizona since Matthews joined the team to start the 2016-17 season. Frederik Andersen didn’t have much to do for the first 10 minutes of Saturday’s game. After that, the Leafs got careless, and Andersen got busy. With a few routine stops under his belt in the opening frame, Andersen turned in his first big save thwarting an excellent chance by Nick Cousins with an equally adept toe-stop. As Arizona increased the pressure, Andersen made a series of critical saves towards the end of the first, including one off his chin that appeared momentarily to have hurt the netminder. But he continued on no worse for wear. By the second period, Andersen was still under siege, and this time gave up two goals to Galchenyuk and Archibald in less than three minutes, the second teed up by his uncontrolled rebound. Andersen then needed some help from Nazem Kadri when Clayton Keller beat the goaltender, but Kadri was in position to make the stick save on his goal line to hold Toronto's deficit at two. That was all Andersen would allow to the Coyotes, even as the streaky play of Toronto’s defence continued in front of him, struggling to stand up to the Coyotes’ forecheck and pressure down low. That kept Andersen the more engaged goalie and he played well down the stretch reading shots through traffic and commotion in his crease. Aside from that poor portion of the second where he floundered, Andersen was solid backstopping a disappointing effort from his team. He finished with 27 saves and a .931 save percentage. The loss dropped Andersen to 6-1-1 in his last seven starts, his previous regulation defeat coming on Jan. 20 at home against Arizona. On a night where the Leafs had too many passengers, William Nylander stood out for his tenacity and bursts of offensive skill. Over the last couple weeks on a line with Kadri and Brown, Nylander has found a comfortable groove in his game, but pushed the pace even further on Saturday, carrying the puck from the defensive zone into the offensive zone and controlling play for the Leafs when he was on the ice at a team-high 64 per cent possession. Not only has Nylander gotten better at identifying soft spots in opponents’ coverage to create chances around the net, but he’s also more aggressive stealing pucks back too, lifting a few Coyotes' sticks to get possession back for Toronto. After a strong first 40 minutes, Nylander was promoted to the John Tavares line with Zach Hyman in the third period and a terrific display of coordination by him in front of the net to deflect a puck high and over top of Kuemper looked like it had cut the Coyotes lead by one. The goal was overturned for the use of a high stick, but the play by Nylander to get in position and tip the puck was impressive. He finished even, with two shots on net and two takeaways in 17:15 time on ice. Following a few failed attempts to get Nylander settled on Matthews’ wing again, Babcock has sheltered Nylander with a third-line assignment and said he wouldn’t move him back permanently until the winger is fully back on his game. With each passing game, that looks closer to being the case. Arizona may be the best penalty-killing team in the NHL, but they’re the second-worst team in the face-off circle at 46.7 per cent, barely ahead of Washington. The Leafs are the second-best face-off team in the league at 52.7 per cent, but stumbled tonight, losing the battle in the dot at 46 per cent. Matthews was the worst of the Leafs’ centres in that respect, winning 6-of-16 draws (38 per cent), followed by Frederik Gauthier (40 per cent), Tavares (53 per cent) and Kadri (67 per cent). Saturday’s loss was the first time this season the Leafs have been shut out on the road. The Leafs finish their six-game road trip against St. Louis on Tuesday.